Enerpac (A Division of Actuant Corp) introduces its DLS Series dozer lift system to the Australasian market. Designed specifically for the CAT D11 and D10 dozers, the DLS Series dozer lift systems are suitable for use in various mining, construction, resources and infrastructure applications, providing safety, efficiency and flexibility during the service and maintenance of the 100,000+kg dozers. The DLS Series dozer lift system provides controlled and consistent lifting with lifting speed at approximately 46mm a minute, allowing users to finish a lift quickly to reduce equipment downtime. In addition to providing easy access, the lift system also minimises operator effort. According to Al Hamdan, Enerpac Integrated Solutions Global Marketing & Innovation Leader, the DLS Series dozer lift system delivers a safe, fast and flexible solution for elevating CAT D10 and D11 dozers when replacing or servicing tracks or side frames. Featuring a four-point custom synchronous lift system for safe load control, the dozer lifts also incorporate two separate lifting units that can be easily moved into position at opposite ends of the dozer. Each lifting unit includes two hydraulically operated jacks with motorised locking rings for user safety. Bolted to a rolling cart with fork pockets and retractable wheels for easy and precise positioning of the lifting units, the front and rear lifting jacks are driven by a hydraulic power unit (HPU) and controls including a 25-foot pendant for operator mobility and safety during lifts. The entire HPU and controls are contained in a rolling cabinet, which includes storage for cable reels and hoses. 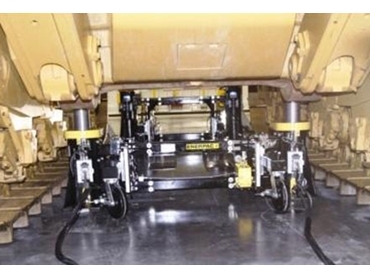 The controls for the DLS Series dozer lift system include PLC and software to monitor and control a maximum of four lifting points simultaneously, with a user-friendly colour touch screen mounted inside the cabinet enabling the operator to remotely monitor key lifting information such as lifting height and load. A single hydraulic unit has the capacity to operate up to six lifting units. Lifting and lowering of the jacks can be paused at any point with the system automatically securing the load until the operator is ready to proceed again. A built-in alarm system will stop the synchronous lift in the event of malfunction.